Annotated view of the Sleeping Giants from the Vandiver overlook at the edge of a rainstorm. Click to enlarge. It was January 2006, and Samford was having an orientation retreat up on Mount Cheaha for faculty that had started in 2005 and 2006. I had been scouring USGS maps like the one above looking for a route to bike from Birmingham to Mount Cheaha. 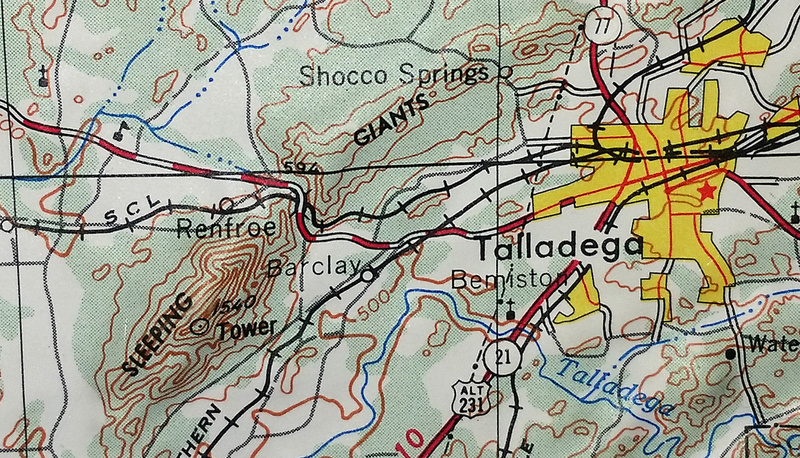 I had noticed the “Sleeping Giants” on the topo map and was looking forward to it as an interesting climb outside of Talladega. But because the road passed right between the two mountains, it was less than 100 feet of elevation gain from the valley floor. Some of the rolling hills by the lake had been steeper and longer. So when I passed under the railroad bridge and started to go downhill I realized I had already finished “the climb” and started laughing at how the road squeezed between the two mountains with hardly any climbing at all. 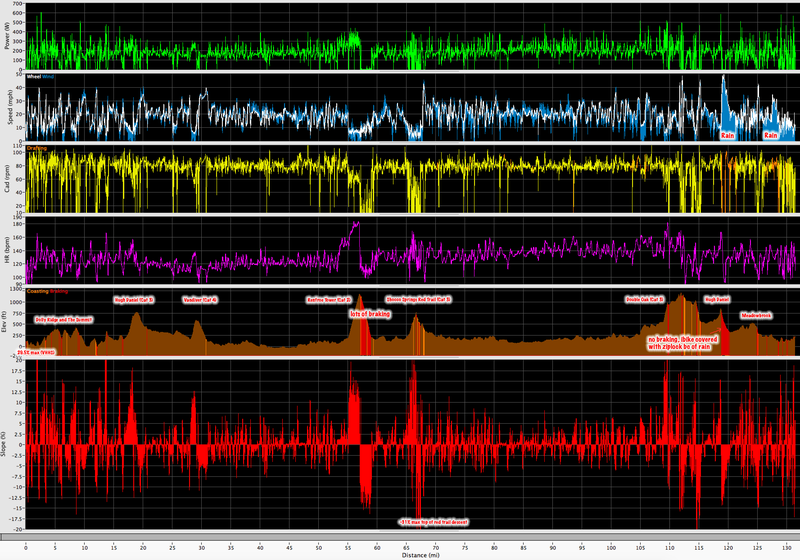 iBike data for the Renfroe Fire Tower Cat 2 Climb. Click to enlarge. Since climbing to the Renfroe Fire Tower that one time, I had always bypassed it on my way to Cheaha. My justification was usually wanting to avoid a flat or getting the chain all muddy so early in the ride. On Tuesday of this week, however, I had some time for a longer ride and decided to make the Renfroe Fire Tower my turnaround point for the ride. I was trying to do the ride with enough time to make it back in time to pick up Josiah from school. But as I got closer to the mountain and was doing my calculations I realized it was going to be unlikely I would make it back in time. So I called Kristine and asked her if she could pick up Josiah, which would give me enough time to not only do the Fire Tower climb, but also ride through the pass between the mountains and climb to the top of the smaller mountain near Shocco Springs. My kids had just gotten back from a weekend retreat there, so I thought they would enjoy seeing my pics from atop the mountain. Thus, in the middle of the ride, the Sleeping Giants adventure was born. Being the middle of the week at 11AM on the leading edge of a major storm system just beyond the end of deer season, which had ended on Sunday, January 31st, I thought it was also just about the perfect time to tread lightly on the fire tower road, which goes through the Sleeping Giant Hunt Club. I always want to be respectful of land rights and stuck carefully to the easement providing access to the fire tower at the top of the mountain. That easement is a rideable dirt road with varying levels of rocky terrain and two small nearly unrideable rocky drainage crossings. 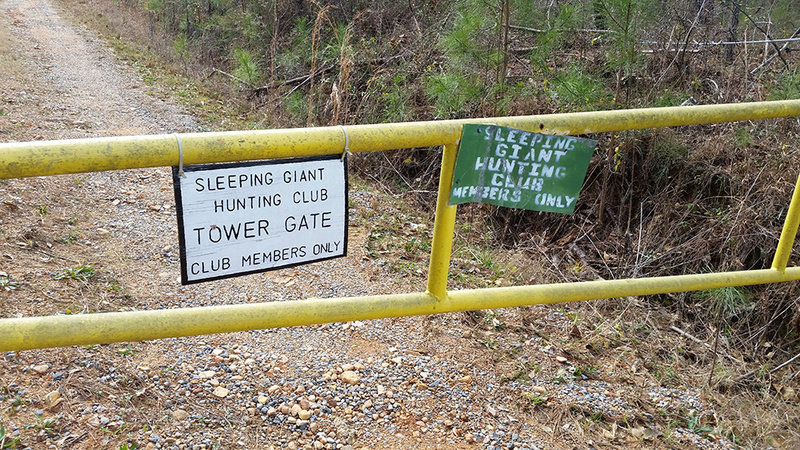 Sleeping Giant tower gate, guest club member. The first time I did the climb I was so proud to have cleared the entire climb without having to put a foot down. This time, I got hung up on the second drainage crossing near the end of it after having made it through the first few tricky feet. I was just getting ready to celebrate having cleared it knowing I could make it the rest of the way to the top with no problem when my rear tire spun out on a wet rock and I had to unclip and put a foot down. Oh well, so close! Cleared this no problem on the way back down after stopping to take a pic – but got hung up on the rocks on the left on the way up. Looking back up at the Sleeping Giant fire tower from just below the top. 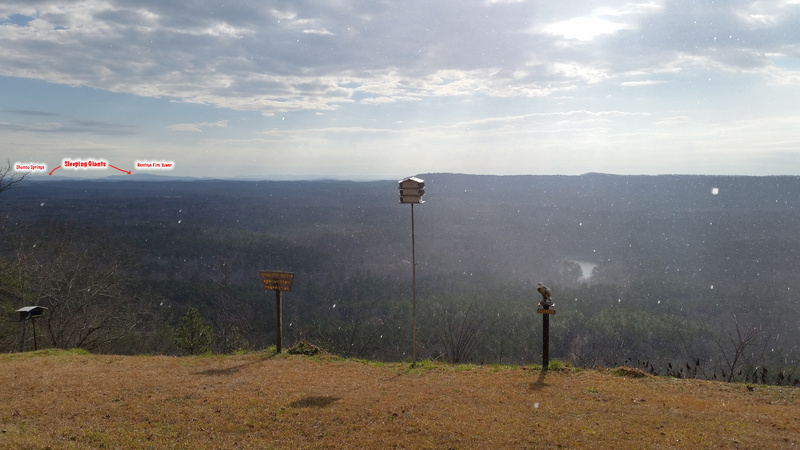 Panorama from the top of the Renfroe Fire Tower climb – not much of a view because of all the trees, but I imagine the view from up in the fire tower would be amazing. Once I made it back down, I took my normal route between the mountains, but then turned on Old Shocco Springs Rd, which was a new road for me. This led me into the side entrance for Shocco Springs. This camp is located right at the foot of the smaller of the two Sleeping Giants. 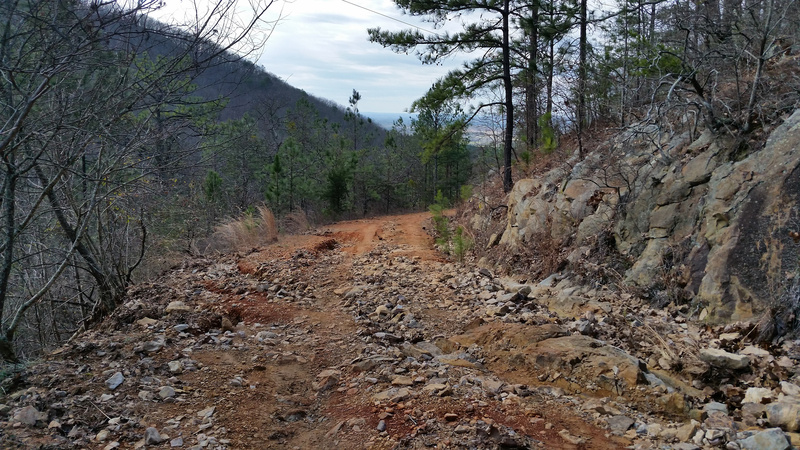 I’ve ridden through there many times on the way back from Cheaha and noticed a hiking trail crossing the road on the steep climb out of the camp. I figured I would see where it went. Sure enough – it wound its way to one of the high points on the smaller mountain. The pic below is from just below the top (rocks visible in the background). About 75% of the trail was rideable, but some of it was just too steep and leaf covered for a road bike – so I hopped off and hike-a-biked my way to the top. Top of the Shocco Springs red trail. Complete annotated iBike data from Sleeping Giants adventure 2016-02-02. Click to enlarge. 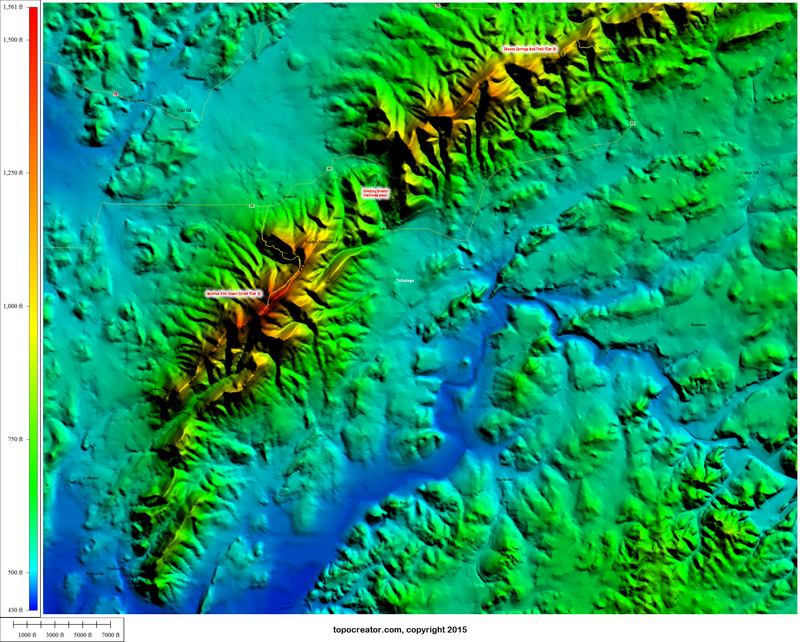 Complete annotated topocreator map – sleeping giants adventure. Click to enlarge. Zoomed in topocreator map of just the sleeping giants. Click to enlarge. Yesterday's ride out to the Sleeping Giants was awesome, here is all 154 pics I took during the ride, which started out with me riding alongside @ktoone and Josiah on their walk to school. 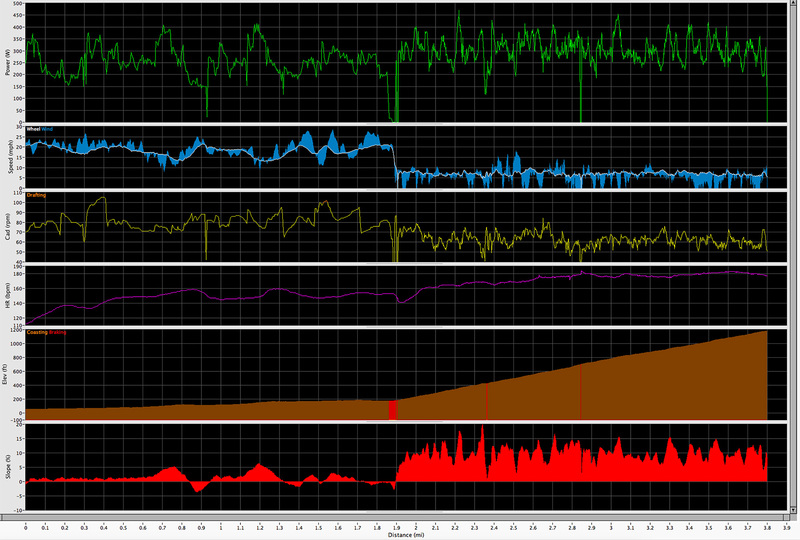 I'm working on an RSS feed where you can follow to see the best pics and ride stats. Stay tuned for more info. This entry was posted in Adventure, Training on February 4, 2016 by kartoone.